Custom Reports give you a top level overview of all the activity completed on your OnePageCRM account. You can generate, save and email reports tailored to your needs. Use Custom Reports to monitor your sales team performance to ensure you're staying on top of sales. Go to Activity → Custom Reports. Select Run to generate your report. Note: You can save a maximum of 3 reports in your OnePageCRM account. To save your report click Save. In the Save report popup, enter a Report name and decide who on your sales team should be able to access it from the drop-down Visible to. To set up email alerts for this report, select the check-box Email this report and decide on the frequency, format and recipients. Saved reports appear in the Custom Reports tab. Note: You can modify and configure your report once generated. Click Run to open your report. Click Refresh to update your report. Custom report settings can be updated to suit your reporting requirements. To modify your custom report criteria, go to Custom Reports → Modify. To configure your report name, visibility and email settings click on the gear icon. To duplicate your report click on the clone icon. Click CSV or Excel to download your report in a CSV format or in an Excel format. There is no limit on the number reports you can generate. You can save a maximum of 3 reports in your OnePageCRM account. 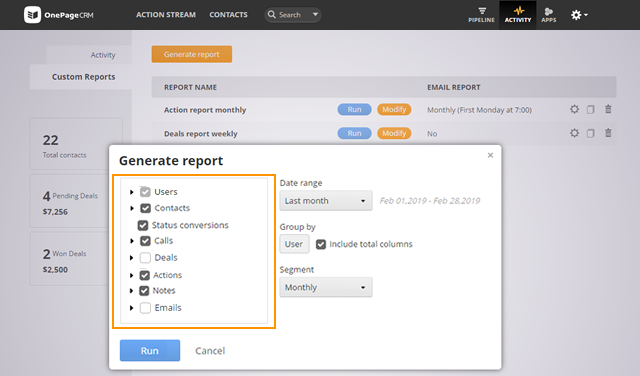 You can configure a report to be sent to all users or specific users. Users cannot create, edit and receive reports unless they have this privilege enabled on their profile by an administrator. See here. 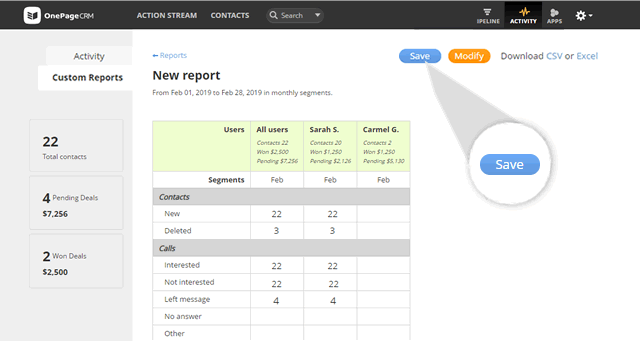 Users can run reports if they are configured to be Visible to all users.